William Kennish served as carpenter from 1834 to 1837 under Captain Sir Thomas Hastings on HMS Excellent, the innovative and world-leading Royal Navy Gunnery School ship at Portsmouth. The figure below shows HMS Excellent in 1833. Researches from the Ship's and Captain's logs (held by the Public Records Office, Kew, London) which are fully detailed in the book, provide an intriguing insight into the work of a carpenter, and the quantity and value of the stores he was able to requisition during his work there. 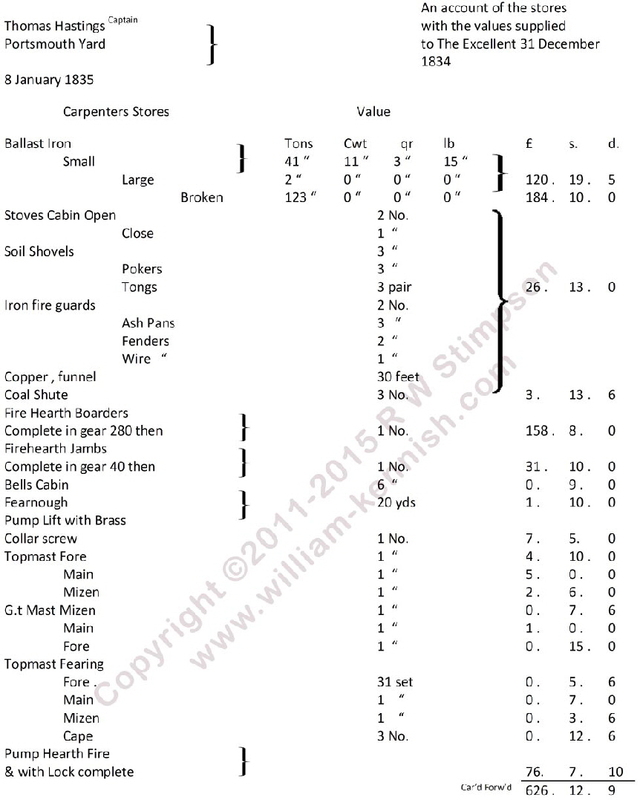 Reproduced below is a copy of one such quarterly stores record which are more fully detailed from page 211 in the book. Here the total of £626.12.9 (six hundred and twenty six pounds, twelve shillings and nine pence) is more than 150 months pay for a Carpenter working on a 2nd or 3rd rate vessel in Ordinary (£4 13s 4d / £4 3s 1d) - compare that with modern earnings and you get a good idea of how much was drawn as stores!